Tracey and her daughter were outside playing. Tracey fell down and landed on her rear end. Tracey’s daughter thought it was hysterical. 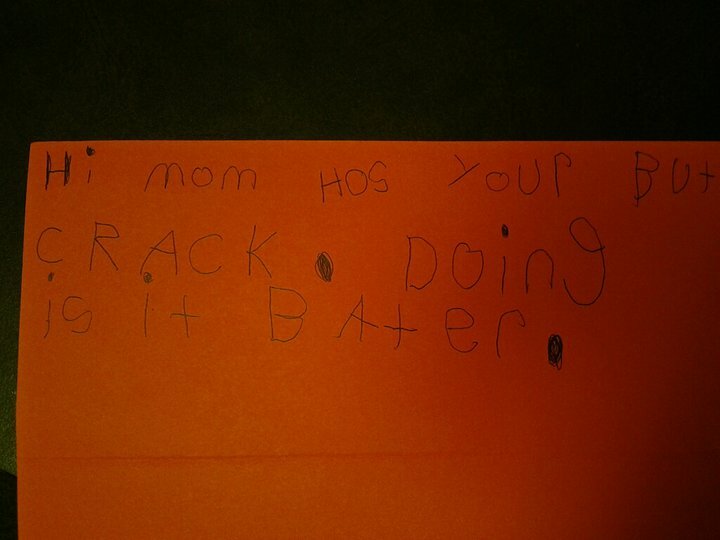 Later, 5-year-old Hannah wrote a note to check on the status of her mom’s posterior. Thanks for sharing, Tracey. We hope your but crack is doing bater. Posted on April 17, 2012, in For Moms, Misspelled, Notes and tagged children writing, funny, funny kids writing, Humor, kid writing, Stuff Kids Write. Bookmark the permalink. 6 Comments. Thanks so much for your concern! My but crack is doing much bater! Doing bater it is, Master Luke. For asking, you I thank. I wonder if my mother kept my notes. I hope not, at least, I hope she won’t send them in. Oh my God, blackmail. Eek! This had me laughing out loud! OMG this stuff is CRACKING ME UP! !